The DUALSHOCK 4 wireless controller features familiar controls, and incorporates several innovative features to usher in a new era of interactive experiences. Its definitive analog sticks and trigger buttons have been improved for greater feel and sensitivity. A multi-touch, clickable touch pad expands gameplay possibilities, while the incorporated light bar in conjunction with the PlayStation Camera allows for easy player identification and screen adjustment when playing with friends in the same room. The addition of the Share button makes utilizing the social capabilities of the PlayStation 4 system as easy as the push of a button. The DUALSHOCK 4 wireless controller is more than a controller; it's your physical connection to a new era of gaming. Join the battle with the Fortnite Bonus Content Bundle. Jump into the worldwide phenomenon Fortnite with this DUALSHOCK 4 Wireless Controller - Fortnite Bonus content bundle, featuring Royale Bomber outfit and 500 V-bucks to get you started. 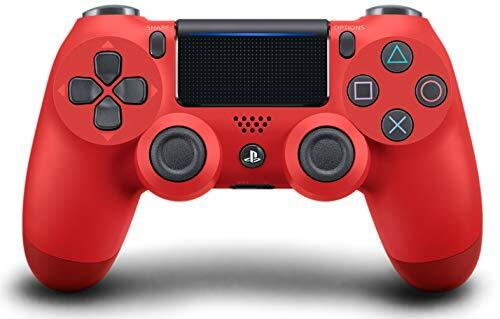 Pair your controller you ll need to pair your controller when you use it for the first time and when you use it with another PS4 system. Turn on the PS4 system and connect the controller with the USB cable to complete device pairing. Hint When you press the (PS) button, the controller turns on and the light bar glows in your assigned color. The color that is assigned depends on the order in which each user presses the PS button. The first controller to connect is blue, with subsequent controllers glowing red, green, and pink. Revolutionary, Intuitive, Precise. 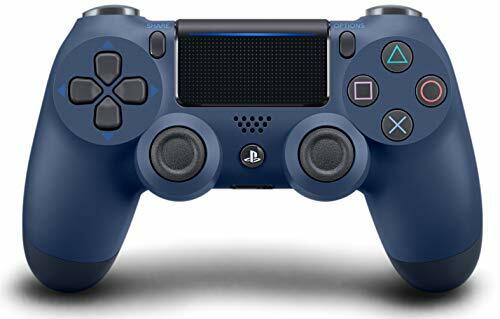 The DualShock 4 Wireless Controller for PlayStation 4 defines this generation of play, combining revolutionary features and comfort with intuitive, precision controls. 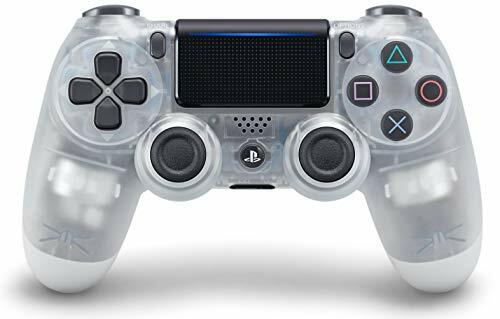 Precision Control: The feel, shape, and sensitivity of the DualShock 4's analog sticks and trigger buttons offer players absolute comfort and control for all games on PlayStation 4. Sharing at your Fingertips: The Share button makes sharing your greatest gaming moments as easy as a push of a button. Upload gameplay videos and screenshots directly from your system or live-stream your gameplay, all without disturbing the game in progress. 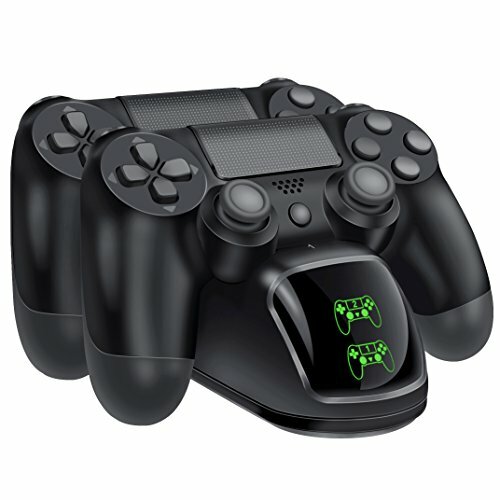 Innovative Features: Revolutionary features like the touch pad, integrated light bar, and built-in speaker offer exciting ways to experience and interact with your games and its 3.5mm audio jack offers a practical personal audio solution for gamers who want to listen to their games in private. 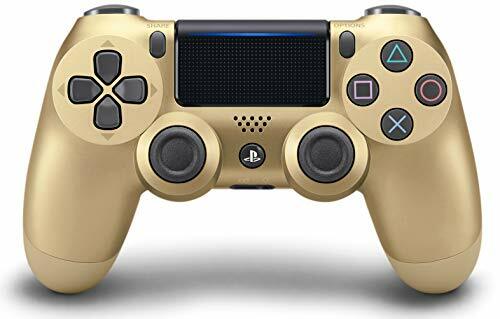 Charge Efficiently: The DualShock 4 Wireless Controller can be easily recharged by plugging it into your PlayStation 4 system, even when on standby, or with any standard charger with a micro-USB port. The DS4 Wireless Controller features familiar PlayStation controls, and incorporates several innovative features to usher in a new era of interactive experiences. Its definitive analog sticks and trigger buttons have been improved for greater feel and sensitivity. A multi-touch, clickable touch pad expands gameplay possibilities, while the incorporated light bar in conjunction with the PlayStation Camera allows for easy player identification and screen adjustment when playing with friends in the same room. The addition of the SHARE button makes utilizing the social capabilities of the PlayStation system as easy as the push of a button. The DUALSHOCK4 Wireless Controller is more than a controller; it's your physical connection to a new era of gaming. 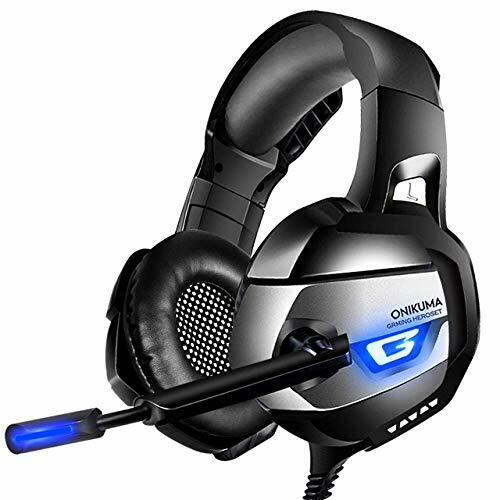 World-leading Brand & Lifetime Warranty As the leader of the gaming headset industry, ONIKUMA has been favorably reviewed by more than 3 million customers. Every item comes with a Lifetime Warranty and customer service respond within 12 hours. Super Real Gaming Experience ONIKUMA K5 gaming headset maximizes the clarity of sound with 7.1 Surround technology. High-grade 60mm driver with neodymium magnets delivers clean clear bass. Just take your gaming experience to a higher level! Great Wide Compatibility It works on Nintendo Switch (audio), Nintendo New 3DS LL/3DS (audio), Nintendo 3DS LL/3DS (audio), Windows PC, Mac OS PC, iOS device, Android device, PS4, PS3, PS vita, Xbox 360 and Xbox One. Xbox One needs accessory. Best-in-Class Mic and Fingertip Control ONIKUMA gaming headset is adjustable and flexible to pick up sound in 360 degree. It equipped with strong cords and joints and features long-lasting durability with USB Mute & Volume Control. Lightweight and Comfort Design Crafted for long gaming sessions. Headset innovates in shape and breathable material for play-all-night comfort! Padded softly, the over-ear ergonomic ear cup is thicker and bigger to isolate ambient noise. 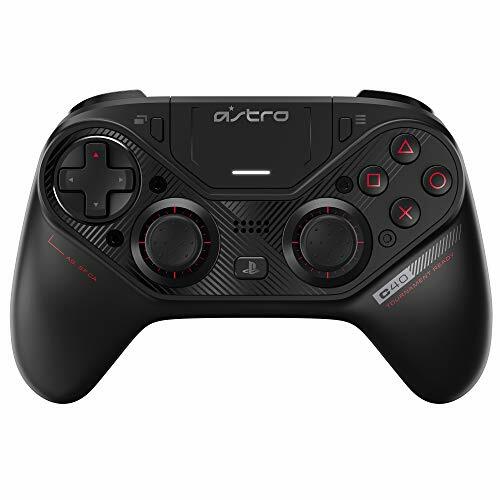 The Astro C40 TR Controller is a fully customizable, high-quality pro controller built for the serious gamer. Durable and serviceable, the C40 TR Controller features swappable, replaceable analog stick and D-Pad modules as well as remappable rear buttons, allowing for multiple configurations and increased speed and accuracy for any playstyle and any genre. Seamless performance in wired or wireless modes with high-fidelity wireless audio. Free software to create and share custom controller profiles. With up to 12+ hours of battery life, the C40 TR Controller is made to outlast your game. The DUALSHOCK 4 Wireless Controller features familiar PlayStation controls, and incorporates several innovative features to usher in a new era of interactive experiences. Its definitive analog sticks and trigger buttons have been improved for greater feel and sensitivity. A multi-touch, clickable touch pad expands gameplay possibilities, while the incorporated light bar in conjunction with the PlayStation Camera allows for easy player identification and screen adjustment when playing with friends in the same room. The addition of the SHARE button makes utilizing the social capabilities of the PlayStation system as easy as the push of a button. The DUALSHOCK 4 Wireless Controller is more than a controller; it s your physical connection to a new era of gaming. 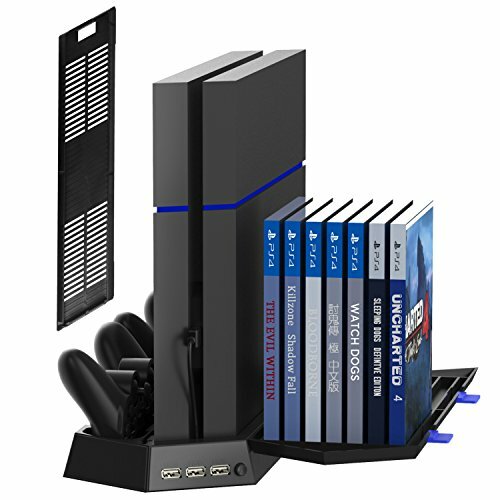 All-In-One: Game console vertical stand+ cooler+ controller charging station+ USB HUB+ 14 slot game disc storage. 2 built-in fans improved at higher speed, disperse heat from your console, improve the operational life span. 3 USB HUB ports for connecting other USB devices: mouse, keyboard headset etc. Not recommended for charging. 2 Controller charging station with higher power to charge both of your controllers faster and simultaneously. Note: Charger will stop working when console off/sleep mode. Features a game storage to store your favorite games up to 14 slots, package include 2 non-slip footpads which keep the games from knocked over. Please note this item not fits PS4 Pro console. Game console, controller and games not included. HyperX Cloud II features a newly designed USB sound card audio control box that amplifies audio and voice for an optimal Hi-Fi gaming experience, so you can hear what you ve been missing. Open up a world of detail other gamers will never know the rustle of a camper s boot, the scuttle in a distant vent. 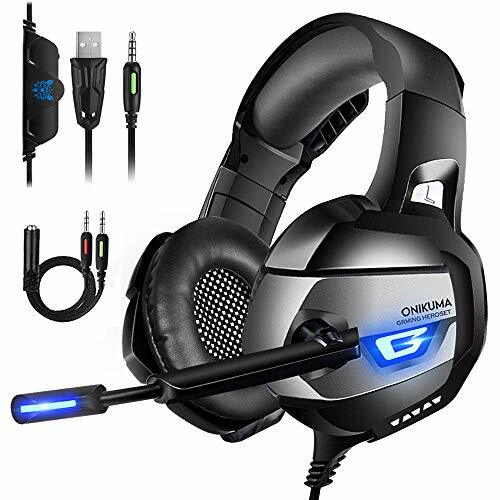 This next-generation headset generates virtual 7.1 surround sound with distance and depth to enhance your gaming, movie or music experience. USB surround sound card works only on PC, Mac, and PS4 This headset will work with the Xbox One with headset adapter from Microsoft. It is not supported with the Xbox 360 or PS3. 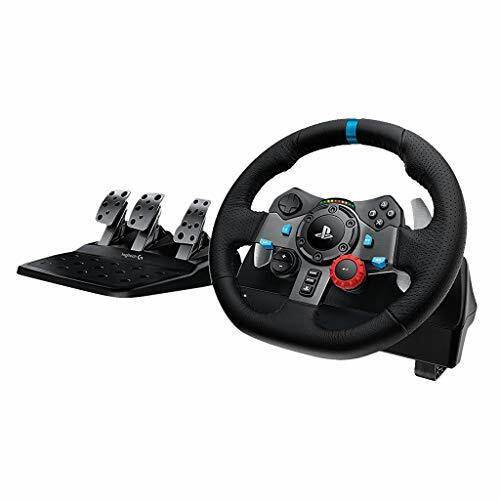 The definitive sim racing wheel for PlayStation 4 and PlayStation 3. Driving Force is designed for the latest racing game titles for your PlayStation 4 or PlayStation 3 console. Add Driving Force to your controller selection and you may never want to race with a regular controller again. With dual-motor force feedback, on-wheel controls and responsive pedals, G29 makes racing feel like the real deal. Attention: We have simplified product package for environmental purpose, but we promise the headset you receive must be brand new. Thanks for your understanding and support. Cool Styling Standard Woodland Camouflage offers a brand new gaming experience. As if in the jungle, it is the best protective color. Let you shuttle unimpeded in the game world. Extremely Comfortable Skin-friendly leather allows you to wear without pressure. It s suitable for you to wear for a long time. Adjustable the headband based on Ergonomics theory to fit all head sizes. High-quality Chat The folding, noise-cancelling microphone reduces distracting background noise allows your teammates to hear you more clearly. Easy to Use On-cable volume control and one key mute. Keeps controls close at hand for quick and precise sound adjustments. Specifications Model: GM-100 Driver diameter: 40mm Impedance: 32 +15% Sensitivity: 105 3dB Frequency range: 15Hz-20KHz Microphone: 6.0x5.0mm Cable length: Approx. 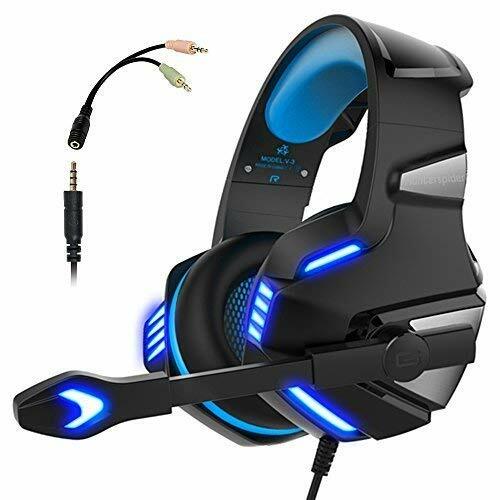 2.1m 0.15 LED Working voltage: DC5V 5% Headset jack: USB+3.5mm Package content 1*Gaming Headset 1*Connector 1*User Manual Note 1.Extra Microsoft adapter (Not Included) is needed when connect with old version Xbox One controller. 2.This headset is NOT USB-Headset, the USB interface is only used for power supply to LED light. Surrounding Stereo Bass Not all the 40mm neodymium drivers have the same sound quality, we focus on gaming, clear sound and powerful stereo bass, when gaming you will catch the footsteps, explosions, gunshots easily. Perfect for various games like Halo 5 Guardians, Metal Gear Solid, Call of Duty, Star Wars Battlefront, Overwatch, World of Warcraft Legion, etc. Durable Material and Lightweight Design Remastered for premium quality, superior comfort and ergonomics. Beexcellent gaming headset uses steel slider and irresistibly soft, comfy and breathable earmuffs - the durable comfort you deserve! The bright LED lights are also here for even better gaming effect. 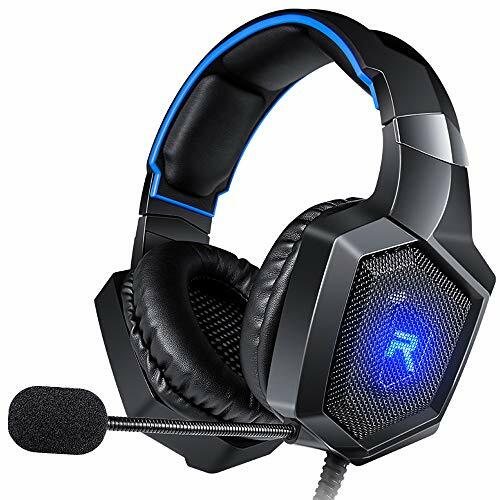 Noise Canceling Microphone + One Key Mute+ Volume Control on cable Splendid ambient noise isolation, anti-winding braided USB cable with rotary volume controller and key microphone mute , which can bring you the best gaming experience, us!!!!!!!!! Multi-platform Compatibility Support PlayStation 4, New Xbox One, PC, Nintendo 3DS, Laptop, PSP, Tablet, iPad, Computer, Mobile Phone. Multiplatform for your maximum enjoyment without breaking the bank! Note: Please read the Compatibility image carefully. Why are ONIKUMA Pro Gaming headset regarded as the top-level professional Model? The flying Bomber is approaching just behind me! remain focused! the simulated full surround sound delivered from the k5-camo brings a breathtaking gaming experience for you and make you All spooled up.You can hear clearly the real magic calls to you.The audio driver with leading techniques enables you enjoy the incoming happy gaming hour.With great forceful k5-camo, its precision and clarity of the balanced sound allows you always ready for battle.The visual hi-fi sound effect draws you to move ahead simultaneously with the game scene.The enhanced noise-canceling Techniques can reduce the hubbub of voices and help you position your enemy effortlessly. superior&durable comfortably> It is indeed a comfortable wearing for a 5-hour gaming session.! you can wear the k5-camo gaming headset for a long time while wearing glasses without any discomfort.The suitable and perfect fit earmuffs are built from memory foam materials available for long-time use, reducing pressure and sweat all through.With the all-round over-ear pads, stretchable head beam and soft headband, The powerful k5-camo is at your command. 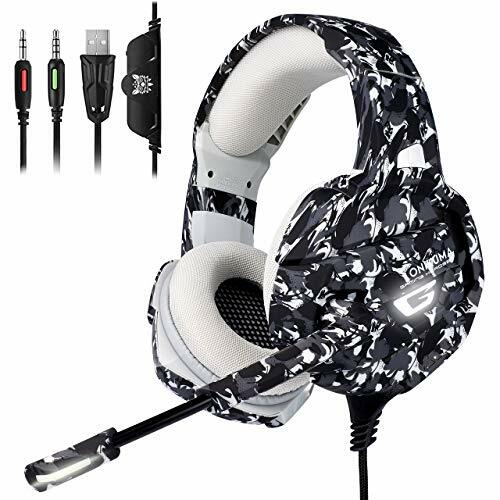  immersive gaming experience onikuma k5-camo gaming headset brings you crystal-clear sound of bombing, footsteps, Warcraft in the flight. With the clear sound of 7.1 virtual Surround Effect, high-grade 50mm driver with neodymium magnets delivers super clean bass. Our Xbox One headset can visualize the scene in your game and help you locate the flying bus accurately. 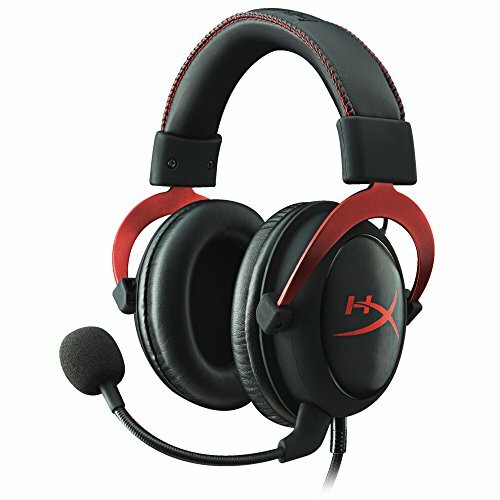 Wise choice for the current top sports games: Loll, csgo, Dota2, Fortnight, PUBG, Apex legends, etc..
 Advanced noise cancellation technology with great sensitivity feature, This gaming Microphone captures the sound on-mi-direction-ally and completely.The ambient noise can be canceled and isolated up to 90%.the superior high fidelity sound effect can make You receive the message timely and feel like communicating with your partner fluently face to face in the real battle.  Prominent Humanized Design Designed for light weight comfort, with ergonomic and durable breathable protein over-ear pads, Retractable head beam, flexible and fit headband, The PS4 headset with mic relieves you from ear pressure, hearing impairment heat sweat in the long time Fierce game. The earphone mic with sparkling LED light can be adjusted flexibly to pick up your voice all-dimension.  Versatile compatibility onikuma gaming headphones with 3.5mm Audio jack are compatible with Nintendo Switch (Audio), Nintendo new 3DS LL/3DS (Audio), Nintendo 3DS LL/3DS (Audio), Windows PC, Mac OS PC, iOS Device, Android device, PS4, PS Vita, Xbox One controller (Please kindly note: newer models have a headphone jack, older ones require an adapter).  100% quality guaranteed & Lifetime warranties high quality and professional technology, ONIKUMA has become the worldwide distinguished gaming headset though persistent efforts in the gaming headset industry. Each gaming headset will go through a strict quality test before sending out. Please assure that PS4 headphone comes with a Lifetime warranty and Customer service respond within 12 hours. Micolindun V3 headset is the ideal headset for gamers looking for lightweight comfort, superior sound quality and added convenience. Its 50mm directional drivers position sound directly into the ear for audio precision and gaming-grade sound quality. 1. 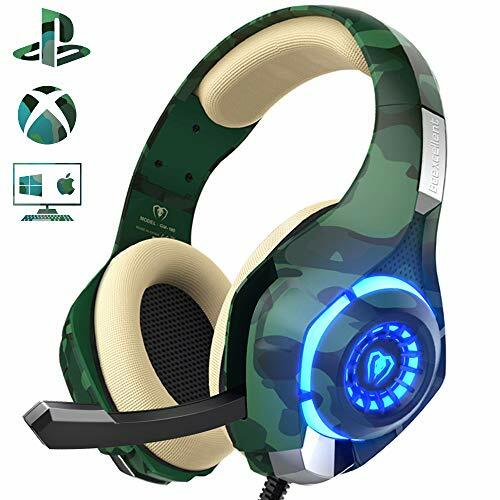 High Compatibility This gaming headset with Y splitter perfectly match with your PS4, New version Xbox One, PSP, Smartphone, tablet, laptop, etc. 2. Practical Design In-line microphone, adjustable angle; Stretchable headband, no worry about size; Braided wire, durable tensile effectively reduce the external resistance and lightweight design is more comfortable for long time wear. 3. Cool Breathing Light Brilliant LED lighting effects, enhancing the atmosphere of games. 4. Especially Convenient Plug & play, no driver needed, 3.5mm plugs for mic and headset + USB plug for lights , more to ensure the stability of the sound. 1. The USB connector is only for LED light. This headset can be used without connecting the USB cable. 2. In the cable control, there is a small button which can be turn on and turn off. Please make sure to turn it on to let the microphone work. Excellent Compatibility Plug &play, no driver needed. Support PlayStation 4, New Xbox One, PC, Nintendo 3DS, Laptop, PSP, Tablet, iPad, Mobile Phone. Please note you need an extra Microsoft Adapter (Not Included) when connect with an old version Xbox One controller and the headset is not compatible with PS3 and Xbox360. With an 1 to 2 adapter included, the headset is suitable for different scenes. Extraordinary Sound Effect Tuned strictly by professional technician, the 50mm large drive unit lay more emphasis on sound performance and create powerful stereo sound, you will fell as if you were truly on the game scene. 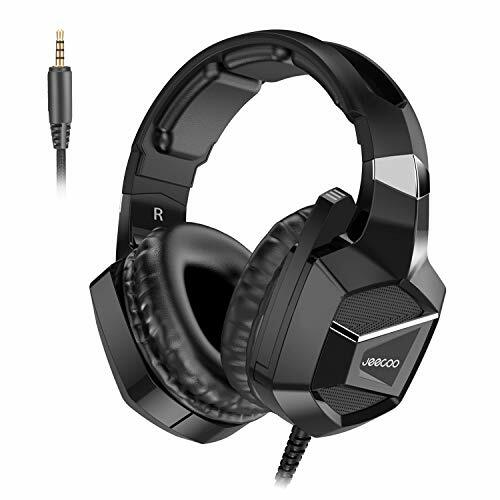 With shocking, clear and deep bass sound effect, this headset is a very good choice for games, movies and music. Upgraded omnidirectional Microphone Soft omnidirectional microphone with noise canceling function can be fixed to any position you want, which reduces noise and ensures a clear voice collection and delivery. In-line controller with volume control and mute key, easy to adjust volume and turn on/off mic during games. 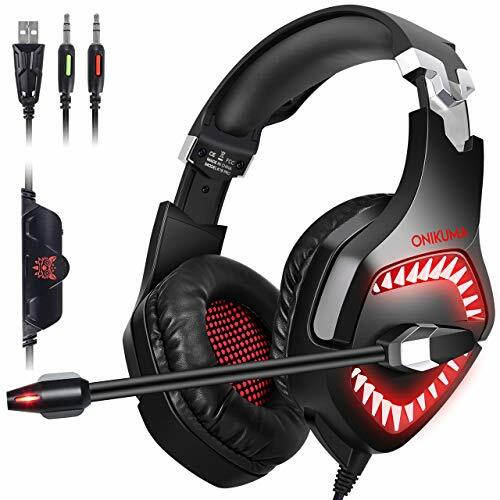 The headset is great for gaming, working, studying, chatting and skype using, etc. 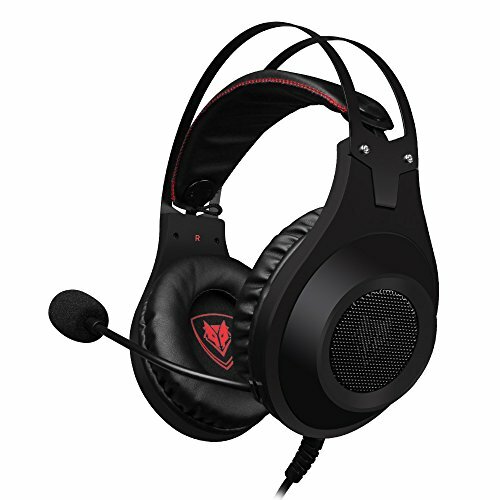 Extreme Comfort Professional gaming headset with super lightweight design which is less than 370g. Soft and comfortable headband and over ear earmuff, no pressure no heat. Your extreme comfort could be ensured even after long time wearing. The adjustable headband can fit heads of different size, suitable for men, women, teenagers and other groups. Unique Gaming Style First Micolindun gaming headset which glowing both in the front and on the side of the earcups, the splendid lighting creates a wonderful game atmosphere. Different from common headsets in the market, this headset is more fighting style visually, go for victory with it ! Looking for the perfect PS4 accessory? 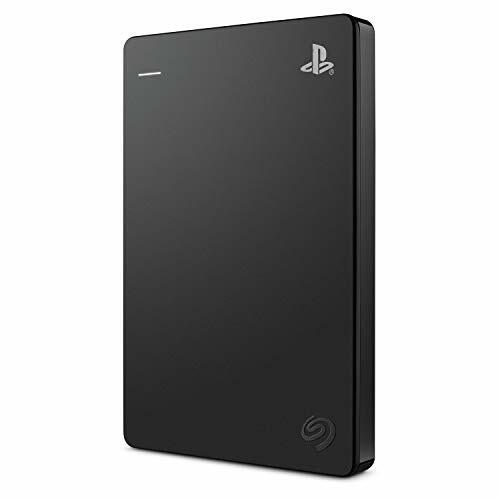 Seagate game Drive is a PlayStation official licensed 2TB Portable external hard drive upgrade for any-generation PS4 system (software version 4.50 or higher). 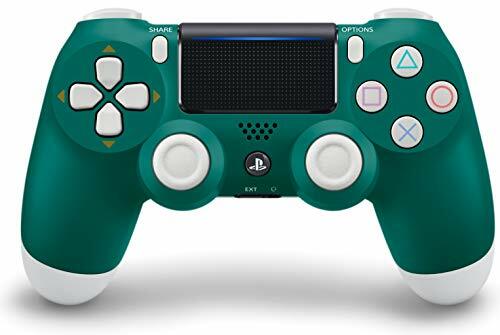 Co-designed with PlayStation for peak compatibility inside and out including PS4 internal drive firmware, and complementary PS4 system aesthetics. With space for approximately 50+ games, this external HDD offers room for plenty of classics and new releases. With seamless USB 3.0 connectivity, simply plug game Drive into the PS4 system's USB port and follow quick step-by-step instructions on the TV screen. MULTI-PLATFORM COMPATIBLE - Works great with PS4/PS4 Pro/Xbox One/PC/Mac/Nintendo Switch/PSP/Tablet/iPad/Desktop/Laptop/Mobile Gaming. Please note you need an extra Microsoft Adapter(Not Included) if you own an old version Xbox One controller. STEREO SURROUND SOUND - High precision 40mm magnetic neodymium driver, excellent ambient noise isolation and acoustic positioning precision enhance the sensitivity of the speaker unit, delivers a high-resolution stereo surround sound and captures the sound of flying bullets, footsteps and all special sound effects throughout the game well. 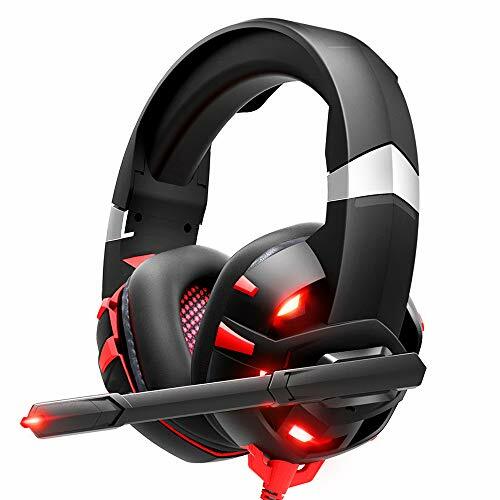 Wide compatiblity onikuma newest gaming headset with mic supports multi-platform device such as PC, PS4 Controller, Nintendo Switch/3DS, PSP, Mac, iOS/Android device, laptop, PC (Win7, Win8, Win10), Xbox One. Note: old version Xbox One requires an adapter (not included). Clear & accurate sound thanks TO high precision 50mm magnetic neodymium driver and featuring 7. Channel Surround sound, ONIKUMA K1 Pro gaming headset provides you with an immersive audio experience like a Grenade blast, or a dubstep drop and footsteps of enemies. Noise-cancelling microphone onikuma PC gaming headset is omnidirectional adjustable and Flexible to pick up voice in 360 degrees. External audio control: mute button and volume control housed on the high-grade durable braided wire are designed conveniently for quick and convenient adjustment. Equipped with super strong cords and joints, ONIKUMA USB Gaming headset features long-lasting durability. Lifetime & 24 hours customer service we offer a lifetime replacement policy and 24-month money back. Being in the industry of gaming headsets for over 10 years gives us a competitive edge that allows us to offer remarkable customer service. The right of every customer is full. Overall, ONIKUMA Gaming headset comes highly recommended!